Globally, leading hospitals and standalone diagnostic centers are experiencing an acute shortfall in the number of radiologists. The number of radiographic procedures being conducted is witnessing tremendous growth but is not being matched by a similar increase in the radiologist population. It is estimated that the number of radiographic imaging procedures are increasing at an annual rate of 15% as compared to a minor 2% increase in the radiologist population, thus leading to a huge supply deficit. Tele-radiology is the ideal solution to address this need. Tele – Radiology is a specialized form of Tele – Medicine which involves transmission of radiographic images from the site of acquisition to the reporting location for the purposes of interpretation and / or consultation. 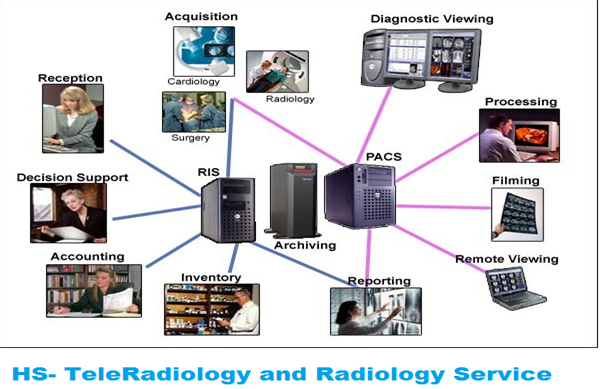 Radiographic images are captured at a distant location and are then transmitted to radiologists in Health Square central reporting hub, through the PACS (Picture Archiving and Communication System) network via internet, where the images are interpreted and reported back to the client. The concept of Tele- radiology revolves around the principles of short turnaround time, cost effectiveness and customized reporting. The Tele-Radiology services at Health Square are backed by a strong team of highly competent radiologists with sub-specialty expertise in Cardiovascular, Musculoskeletal and Neuro-radiology. Clients are provided with detailed reports in the fast turnaround time (less than 30 minutes for emergency reporting). Apart from providing best-in-class radiology reporting services, Health Square also facilitates technical support to its clients including system installation, linking facilities and workflow management. Health Square radiologists are available round the clock to answer queries of clients, discuss reports and highlight critical findings to the referring physicians, thereby contributing to the ultimate goal of improved patient care.